Sara Ali Khan: How She Lost Oodles Of Weight And Became A Gorgeous Young Lady! 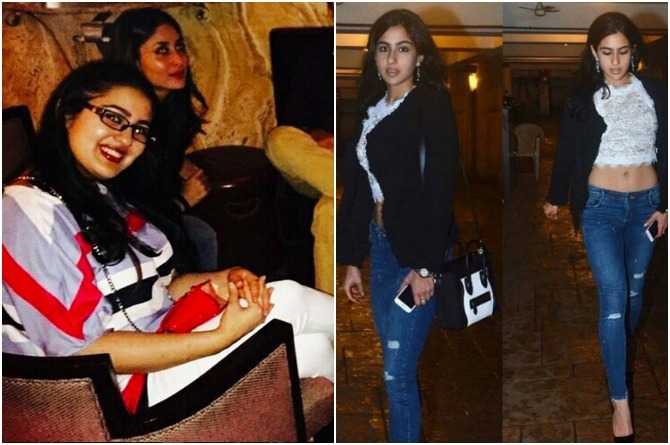 How Sara Ali Khan lost oodles of weight and became a gorgeous young lady! For the past few months, speculations have been rife that Saif Ali Khan and Amrita Singh's daughter Sara Ali Khan will soon make her on-screen debut. The rumours started doing the rounds while the star kid was still studying at the prestigious Columbia University. In fact, her father was also questioned about her choice to enter the film industry, to which he responded by saying, "Of course, I won't have any problem. It is a wonderful profession. But I would have a problem with her leaving the college and getting into movies." "One day, she messaged me saying she wants to join movies. It was a slightly strangely-worded message but I replied, 'Yes, but after college.' Then there was some silence. Obviously, she doesn't know what she is saying. Some days, she wants to be a lawyer, someday a doctor, then one day she told me she wants to be working at the White House...Nobody leaves Columbia University! Anyone in the world would give their left arm to go to an Ivy League university," added the concerned father. But now it seems that she is actually ready to join the movies and working hard towards a complete physical transformation. Over the past few months, Sara has been making some very trendy appearances and one can notice a complete change in her. She has lost oodles of weight and is setting new fitness goals by hitting the gym. In fact, the confident 23-year-old first made a splash in the Indian paparazzi circles when she was spotted at the screening of the much-in-news Marathi flick Sairat. She again made headlines when she stepped out to visit mum-to-be Kareena Kapoor Khan's birthday bash in a white crop top over blue distressed jeans. From her cute and chubby self a few years back to her svelte avatar in recent times, Sara Ali Khan is already playing the quintessential diva. She has also reportedly chosen a talent agency that is helping her work on her makeover! In fact, her mother Amrita Singh also recently shared how her little daughter decided to join the industry and work hard on her physical transformation. Continue reading to see what Amrita Singh said about Sara's debut in Bollywood and why she is happy with her decision. As any star kid Sara has also chosen to work on a career in the film industry and is giving us serious fitness goals, thanks to her amazing physical transformation. But this transformation hasn't come easy for her, and the best person to explain why is her mother Amrita Singh. While Sara has been mum on the subject of her career, her mum has cleared the air adding that Sara has been working hard on herself. Talking about her daughter's choice and her kid's strong opinion Singh said, "Let me tell you, today’s kids have a mind of their own, and they know how to exercise it. Even if I wanted to tell Sara or my son Ibrahim how to lead their lives, which I don’t, they would not listen to me. Luckily Sara chose to complete her studies before pursuing acting. She attended Columbia University and then devoted attention to Bollywood. What if she had decided to not go to college? What could I do?" As for her acting debut Singh says, "At this moment, the one certainty about Sara’s career is that she will be an actor. She decided that at the age of 4. Having said that, let me very clearly state she has not signed any film as yet. We are waiting for the correct project." Well, Amrita has certainly made it clear that her daughter is very much going to be a star, whether in the immediate future or after a few years is yet to be revealed. But one thing is for sure, Sara Ali Khan is working hard on her look and she has the support of her parents. Understand the changing world: There are many career options for kids and they no longer have to be just engineers or doctors. So try to understand the new roles and job opportunities that are being created and encourage your kids to adapt to the new changes with requisite skill set. Encourage your kid's individuality: Don't unintentionally force your kid to fulfill your own dreams. Instead, encourage them to follow their own dreams and be their own person, which may be different from your point of view. Take help from teachers or peers to understand how to help your kid realise their own potential and their dream jobs and careers. Encourage social networking: It may sound like you should allow your kids to party, but it's not. Ask your kids to network at events of their interest and talk to CEOs and those established in the field to understand how the industry works. It is a very helpful exercise, especially when your kids have chosen an unconventional career.